Mulgrew thanks DA for what we’ve accomplished. Says we’ve killed Cuomo’s rating in 2 months, while it took us two years to hit Bloomberg. Video about teacher leader positions comes on. Plays “Feels so Good,” by Chuck Mangione in background. Narrator speaks very fast. Tough to focus on what he’s selling. Various teachers explain why they’ve taken these jobs. Chuck Mangione plays again as teachers explain how wonderful this program is. One teacher speaks of walls between classrooms falling down, and it’s hard for me to imagine it isn’t literal. Narrator blabbers again as Mangione music rises to crescendo and video mercifully ends. Mulgrew speaks of a college he visited, which he won’t name, ridicules professors for saying Obama plans failed, that poverty affects education, that teachers should be involved, and says he told them we didn’t want their help and could do things ourselves. Apparently the solution is improving things involves keeping higher ed. teachers away from us. Amy Arundell introduces chapter leaders and model and master teachers. Mulgrew tells them they are master and model teachers and should talk about what they do. Master and model teachers oblige. Students of one master teacher, who appears to have a sense of humor, refer to themselves as “master students.” Chapter leader says she shifted the negative mindset of teachers by calling model teachers “public learners” so as to avoid stigma. Mulgrew says it’s important that we’re figuring things out with model and master teachers, says we can figure things out while people outside cannot. Mulgrew praises city’s recognition of Muslim holidays. Says first day meeting will mostly be used to set up classroom. Mulgrew says Eva taking Lobby Day for Eva day was a mistake. Says difference between her and us is we would never drag students on buses mid-winter to make political point. Says he got best reports ever from legislators this year, and that they know the fight is in Albany this year rather than in NYC. Says he lobbied with teachers from PROSE schools. Says we will move our school system and demanded that if legislators wouldn’t help they should get out of the way. Mulgrew, who is on neither Facebook nor Twitter, speaks of the millions of hits UFT has received on Facebook recently. Mulgrew says we like to work in difficult situations. Says message we get from Albany is that we should avoid teaching needy kids, that we will fight it. Thanks those who went to Lobby Day. Says he said many bad words about Cuomo and doesn’t know how to use good words. Blames it on years of being a carpenter. Says legislators all wonder why Cuomo won’t pay the 2.5 billion he owes us. Praises us for being on social media. Says in first such 13% case, arbitrator ruled for chapter leader who got bad rating for doing her job. Crowd applauds. Says nothing of 87% who don't get benefit of arbitrators. Mulgrew says that principal needs to go. Mulgrew says kids can still be suspended. Says only real change is schools should first and foremost focus on culture that says school is managed well. Says Bloomberg overdid it and would place 4 lawyers in a room with a kid who cursed at someone. Says networks will be gone June 30th, to applause. Says this is last big piece of reorganization, but chancellor has been reorganizing throughout. Mulgrew praises Chuy Garcia in Chicago, who Rahm outspent 12 to 1. 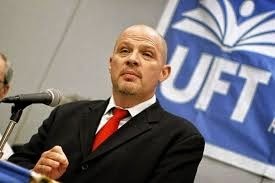 Says UFT raised money for fundraiser last Monday. Praises retirees who have helped in Chicago. Mulgrew describes week of March 12th, shows video he says has gone viral, discussing things that happened one day in classrooms. Video describes human contact that cannot be measured by test scores. Says children will suffer from reformy nonsense, and that education is not a business. Mulgrew says we are fighting Cuomo, that he hits us and we hit back. Says Cuomo is having a bad week and book is coming out about him. Says governor came out saying he wouldn’t compromise but it hasn’t worked out for him as he is fought across state. Approval rating on ed. gone from 60s to 23%. Calls Cuomo a liar. Mulgrew speaks of Saturday rally. Says NYSUT will bus people from Buffalo. Says we did it on a Saturday in NYC on purpose, that it doesn’t matter whether or not budget is done because fight won’t end this year. Praises Heastie. Says GOP leader will not vote on budget that ties funding to APPR, that we must make our voices heard and be out in force on Saturday. Says governor is dug in on his positions, but that parents do not want increased use of tests. Mulgrew wants Saturday to be celebration of all the work we’ve done with all of our partners. Says there will be bands playing, media coverage, but we will send message we will not allow our schools to be destroyed. Asks us all to come. Ends report. Leroy Barr says 1,000 people came to para luncheon. Speaks of high school awards, 5K run. Says March 16th was UFT’s birthday. Ends report. Mulgrew, discussing consultation committee decorum in response to a question, speaks of how collaboration is defined by action, not words. Piques my interest. Mulgrew says there must be more flexibility in parent engagement. Says time is very valuable and we don’t want to waste it. Asks if anyone wants to go back to 37.5 minutes and crowd says no. Says teachers tell him PD is OK but they really like Wednesday, Thursday, and Friday. Question—what is matrix model for evaluation? Mulgrew says it’s a box graph. Says UFT opposed 100 point system. Says “we” introduced box graph now known as the matrix. Says it will solve anomalies in 100 point system. Issue is what goes into score in terms of student achievement. Mulgrew says we use a growth model, that we’re comfortable with it, but that state wants a value-added model. Criticizes system he helped pass and heralded as wonderful a few years ago, says we prefer box graph, which is much simpler. Says school districts where all teachers were rated with very good or very bad ratings are result of 100 point system. Motion—for this months agenda—Lauren Cohen, wearing MORE shirt, springs from her seat and proposes resolution for this month opposing standardized testing, prominently labeled from MORE caucus of UFT. Mulgrew says she can present, and it will take 2/3 motion to place on agenda. Editorial comment—I love it. This is a really strong resolution supporting opt-out and opposing high-stakes testing, Common Core based testing until it has been tested. Sparse applause. James Vasquez questions whether resolution is appropriate, as there is similar one on agenda. Mulgrew says it can be voted on. Jonathan Halabi calls for support of fast food worker strike. Mulgrew says he can’t speak to it. Motion is placed on this month’s agenda. Motion for next month’s agenda—that UFT endorse Progressive labor party’s Mayday march. Leroy Barr opposes. Says we support worker and immigrant rights, but suggests we cannot combine different issues. Resolution voted down. Fast food reso moved up. Halabi speaks of fast food worker campaign. Resolution carries. Resolution to honor 55th anniversary of union, one week after anniversary. Member proposes amendments. Leroy Barr speaks against. Passionately speaks of founders who gave him benefits, right to speak out. We are keepers of the flame, and apparently pride entails criticizing the very voice he claims our founders enabled. Yelena Siwinski raises point of order, states it is inappropriate and disrespectful to insult the speaker who offered an amendment. Mulgrew says it isn't a point of order. Motion to celebrate anniversary passes. Motion to extend 15 minutes so we can discuss testing. Motion fails. Mulgrew leads singing of happy birthday to UFT.